It's been a fair few months since the Pebble Smartwatch popped up on Kickstarter and subsequently smashed through their $100,000 target to reach over $10 million in funding. Since then it wasn't all plain sailing, in fact there's been a couple of hiccups and a couple of pleasant changes for their 68,000 Kickstarter backers! 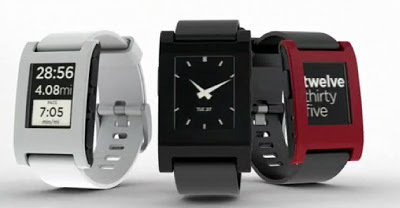 Now though none of that matters as Pebble took to the stage at CES today and showed of the smartwatch everyone has been waiting for! The Pebble watch definitely doesn't look as clunky as the Sony Ericsson LiveView and fingers crossed that this won't have the same issues that device did keeping a connection either! The Pebble promises to sync effortlessly with your Android or iOS smartphone and it can offer you things like Facebook updates, text, Google+ and iMessages, music controls, and most importantly you can see the time. The smartwatch is currently being produced in quantities of 15,000 a week, so Pebble will have all 85,000 pre-orders ready pretty soon! But, once you get your device that's not the end of the support. The company has pledge to update the device on a 2 to 3 week basis after its launch to give the device all the functionality that backers were promised when they pledged their Kickstarter money! Now that's all well and good assuming your phone can power the Bluetooth connection well enough. Pebble says that you shouldn't worry too much because in their experience it will only use somewhere between 5 and 10% of your phones battery. That sounds like a sacrifice worth making to us! Kickstarter backers you will receive your lovely new device on or after January the 23rd! So not too long to wait! If you missed the show then you can catch up on the demo here! We know the video goes a strange colour at one point, hopefully that'll be fixed soon! Via Engadget, Kickstarter, Slashgear and NYTimes.